Any of the above herbs can be taken for morning insomnia, and they’ll probably work for a while. However, the cause behind morning insomnia tends to be a spike in cortisol levels (a steroid hormone released by the adrenal glands in response to stress). An overly-high cortisol level can lead to a suppressed immune system, blood sugar irregularities, and can contribute to weight gain in the belly area. If you suspect you have high cortisol, I encourage you to have your levels checked by an MD. However, you can try the following first, and see how you do. Also—I’ve found that people who eat low-carbohydrate diets (fewer than 14 grams of carbs per meal) tend to suffer from this type of insomnia. Try eating a small snack that combines protein, fat, and carbohydrates (such as almond butter on sprouted toast) right before bed. You can have a small snack again if you wake in the early hours. The drop in blood sugar that low-carb eaters experience can spike cortisol levels, leading to anxiety and sleeplessness. Magnolia bark helps to relax the mind and body by lowering cortisol levels. This, in turn, can help prevent obesity and type II diabetes. 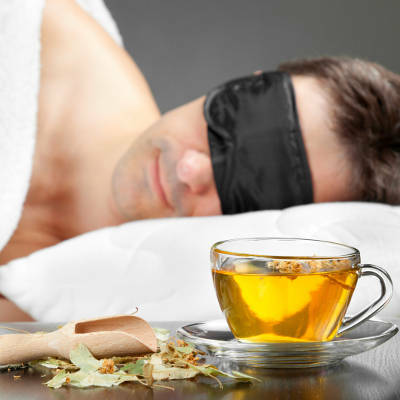 Try taking this herb before bed or when you wake in the night only (more so than the other recommended herbs, since magnolia bark promotes rapid drowsiness, don’t take it during the day or before operating vehicles or heavy machinery). Start with one capsule when needed (generally 200mg of herb per capsule). Pregnant and nursing women should avoid this herb. Ashwagandha is a remarkable herb in that it treats stress without sapping energy. However, even though it’s not a sedative per se, it helps get you back to sleep if you are experiencing the morning cortisol/anxiety spike. Not only does this herb delay the release of cortisol, it gets to work healing the effects of stress on the body. Try taking 500mg as a daily tonic. This herb is safe for everyone. Seriphos, the brand name for the dietary supplement of Phosphoserine, is an adaptogen and adrenal supporter. I’ve found that it works wonders with an over-active cortisol level. Try taking one before bed as well as one upon waking in the night. You can increase the dose if you need to. A note from the makers of Seriphos: Seriphos should not be given to people using alkaloid stimulants or on adrenergic agonists; it is not recommended for use during pregnancy or for people with reduced kidney function or failure. If you have a sensitive stomach, take Seriphos with food.